Just that. But with so much behind them! A ‘W,’ for World. The world we all want to protect and preserve for our kids and grandchildren. A ‘P,’ For Paper – a fantastically useful information storage medium that helped civilisation build, without a doubt – but which now needs to take its place along with papyrus and stretched goat skin in the museum, as its use is clogging up business processes and losing us too many of our precious trees. ‘F,’ for Free. How we want business workflows to be. Digital, secure, organised. Efficient. ‘D.’ A 24 hour period – but not just any day; it’s going to be a special day for all of us, as it’s a day we’re going to challenge ourselves to be creative about avoiding use of paper from midnight to midnight! I’m referring of course, to the event behind those four letters and snappy hashtag – World Paper Free Day. 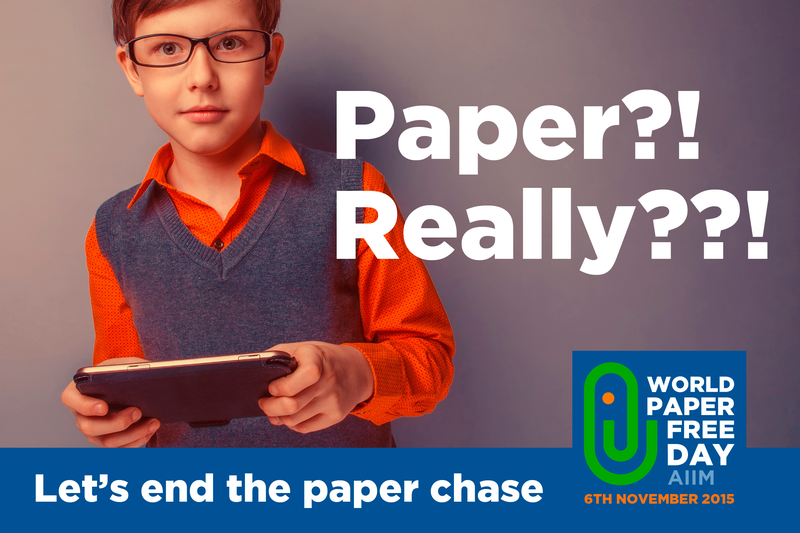 World Paper Free Day is an awesome campaign we’ve been running for the last few years out of AIIM, with the 2015 Day set to take place just three weeks away, on Friday, 6th November – check out our dedicated micro-site here. We run the Day because we are more and more concerned – as I am sure you are – about the globe’s continuing reliance on paper. That’s a reliance that has real, dollar-pound-euro cost. Sustainability charity WRAP (Waste and Resources Action Programme) has conducted research that shows around 25 sheets of paper get generated every day that are pure waste and immediately discarded. We all know there are much better, electronic, ways of sharing information. But for some reason, governments, enterprises, SMBs, even NGOs, haven’t heard the word yet. Can I ask everyone to lend a hand to #WPFD 2015 and help get that word out? It’s not just me or AIIM that needs you to. It’s Mother Earth herself. Let’s help her out a bit. Here at thedmcollaborators, we agree with John and the principles he’s talked about. So we’d love the UK DM community to get behind #WPFD, as it’s a campaign that promotes business adoption of paper-less working and digital ways of working with content. 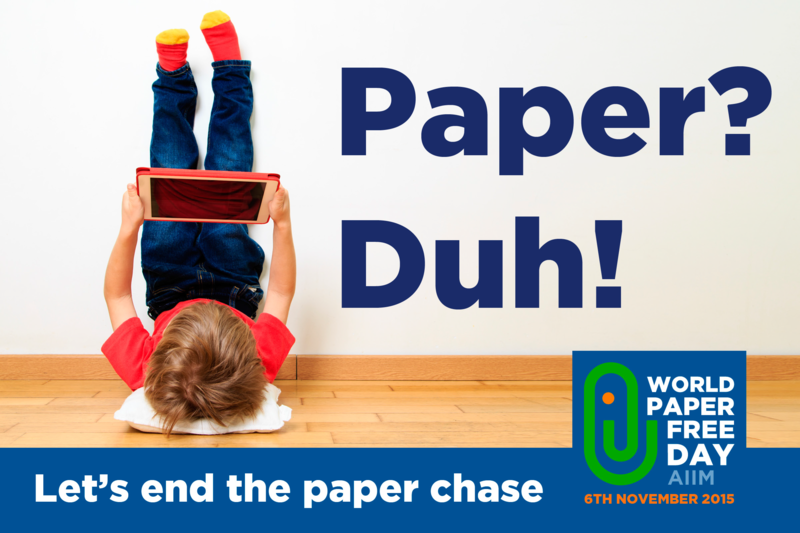 The simplest way to do that is for you and your team to ‘sign the pledge’ and agree to go paper-free on November 6! Find out about signing up here. There, you can easily download the logo and automatic updates on what the rest of your paper-banners are up to. As an added incentive, be aware that each registration means one immediate contribution to this year’s supported charity, One Laptop Per Child, a drive to put tech in the eager hands of children in the developing world. If you are feeling inspired by all this – and we hope you are! – then you can go one step further, by entering a fun competition AIIM’s set up with Fujitsu. 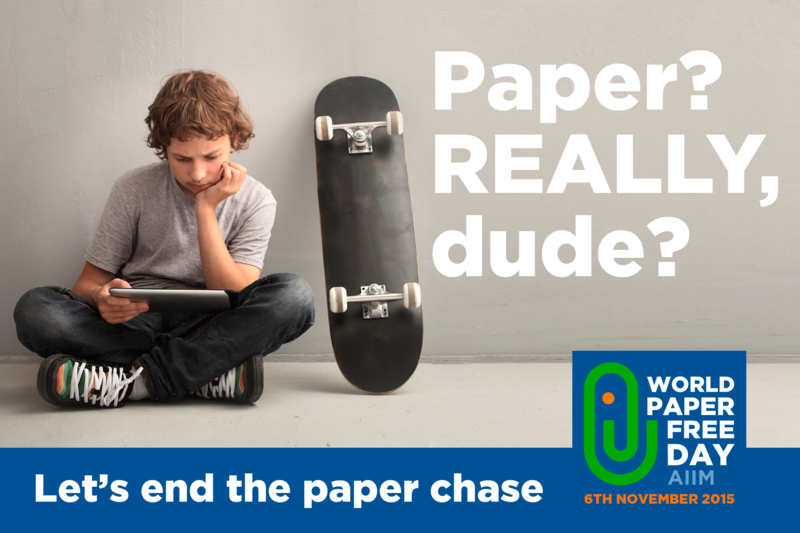 If you take a photo that illustrates the hassles that paper creates in your worklife or office, share it on social media with the #WPFD hashtag, and a joint AIIM-Fujitsu team will be looking out for it! Be as creative and humorous as you like, that’s what the competition’s all about – and if you win, one of the five new Fujitsu ScanSnap iX100 mobile scanners will be on their way to you. Finally, follow all the #WPFD fun online at all the links below – but don’t just follow it, join in the debate. We want to know things like, How is your company getting rid of paper? What is the business process that’s most benefited from having paper squeezed out of it? Is paper an issue in your personal or home life? What do you want to see as the lasting result of #WPFD 2015? And so on – don’t be shy about sharing your views. See you on the Day – which is, one last time, Friday, November 6, 2015. Good luck to all #WPFD supporters!